To support the increasing research interest in small RNA, CD Genomics is offering the qualified small RNA sequencing service that covers novel small RNA discovery, mutation characterization, and expression profiling of small RNAs by leveraging of advanced NGS technologies and data analysis pipeline. Small RNA species generally include the most common and well-studied microRNA (miRNA), small interfering RNA (siRNA), and piwi-interacting RNA (piRNA), as well as other types of small RNA, such as small nucleolar RNA (snoRNA) and small nuclear RNA (snRNA). Small RNA is a type of lowly abundant, short in length (<200 nt), non-protein-coding RNAs that lack polyadenylation. Small RNA populations can vary significantly among different tissue types and species. Generally, small RNAs are formed by fragmentation of longer RNA sequences with the help of dedicated sets of enzymes and other proteins. Small RNAs act in gene silencing and post-transcriptional regulation of gene expression. However, small RNA is not sufficient for the induction of RNA inference. It generally needs to form the core of the RNA-protein complex known as RNA-induced silencing complex (RISC). siRNAs can cleave the mRNA in the middle of the mRNA-siRNA duplex, and the resulting mRNA halves are degraded by other cellular enzymes. Unlike the siRNA pathway, miRNA-mediated degradation is initiated by enzymatic removal of the mRNA polyA tail. piRNAs are essential for the development of germ cells. Small RNAs have been demonstrated to be involved in a number of biological processes including development, cell proliferation and differentiation, and apoptosis. By taking advantage of tremendous output with unprecedented sensitivity and dynamic range, NGS can identify weakly expressed small RNAs as well as quantitatively reveal heterogeneity in length and sequence. NGS is a powerful tool for investigating the function of small RNAs and prediction of potential mRNA target molecules without requiring available reference genomes. Obtaining a premium small RNA sequencing library begins with the isolation of small RNAs by size fractionation using gel electrophoresis selection or silica spin columns from total RNA. Following RNA adapter ligation using a 5’ adenylated DNA adapter with a blocked 3’end, small RNAs are reverse transcribed, amplified by PCR and sequenced. To identify and annotate known miRNAs, the sequencing reads can be mapped to a species-specific database, such as mirWalk and miRBase. CD Genomics utilizes the Illumina HiSeq platforms to sequence small RNAs. We have flexible strategies for miRNA (15-30nt) and/or small RNA (30-200nt) discovery and profiling. Our highly experienced expert team executes quality management, following every procedure to ensure confident and unbiased results. The general workflow for small RNA sequencing is outlined below. CD Genomics provides full small RNA sequencing service packages including sample standardization, library preparation, deep sequencing, raw data quality control, genome assembly, and customized bioinformatics analysis. We can tailor this pipeline to your research interest. If you have additional requirements or questions, please feel free to contact us. 1. What is the workflow for data pre-processing? The first steps are adapter trimming using FASTX and an optional k-mer correction using ECHO. Subsequently, the expression profile is formed by genome mapping and annotation. If the number of reads per sample varies, normalization is applied to offset under-sampling effects. 2. How many reads are required for small RNA sequencing? It depends on your application. For expression profiling, an accepted range for mapped reads per sample is 100K-2M. For discovery applications, at least 5-10M should be considered. 3. How many biological replicates do I need for each condition? Biological replicates can increase confidence and reduce experimental error, and we recommend you submit at least three replicates per sample. Note that the final number of replicates is determined by your final experimental conditions. 4. How should I ship samples? You may ship with dry ice or RNAstable at room temperature. Empirically, shipping RNA samples in RNAstable yields good RNA quality after reconstitution. 5. Can I submit E. coli cells or tissue samples? Yes, apart from RNAs, you can also submit frozen E. coli cell pellets or tissues with dry ice. 6. Is poly-A enrichment or RNA depletion required for microRNA sequencing? No enrichment is required for microRNA sequencing because adapters are selectively ligated to small RNAs only. 7. I found that I could not open the downloaded fastq file. Please make sure that your computer has enough RAM to open the large files. You can open them by text editor on windows computers with enough RAM, or on Linux computers, which is a preferred option. Alternatively, you may consider other fastq specific readers. MicroRNAs (miRNAs) regulate gene expression primarily through translational repression of target mRNA molecules. Over 2700 human miRNAs have been identified and some were associated with disease phenotypes and showed tissue-specific patterns of expression. The authors conducted small RNA sequencing studies on 93 human post-mortem prefrontal cortex samples from patients with Huntington’s disease or Parkinson’s disease. And they successfully discovered 99 putative novel miRNAs. Figure 1. Flowchart depiction of the novel miRNA discovery pipeline. 1. Total 8891 miRNAs were identified. 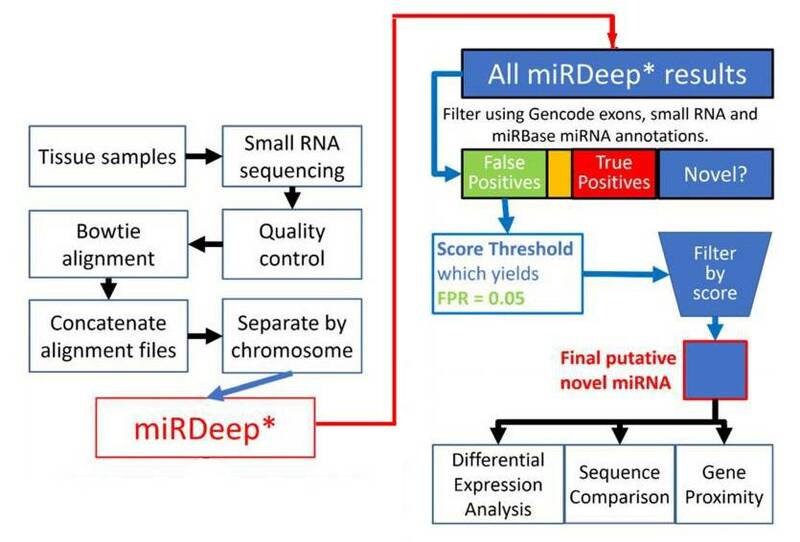 miRDeep* analysis of sequence data from 93 human prefrontal cortex samples identified 8891 miRNAs. 3641 miRNAs were remained after filtering for known miRNAs from miRBase v20, other small RNAs and exons. The rest were filtered by the miRDeep* score. Higher scores indicate higher confidence of a miRNA result. Total 99 putative novel miRNAs were finally identified. 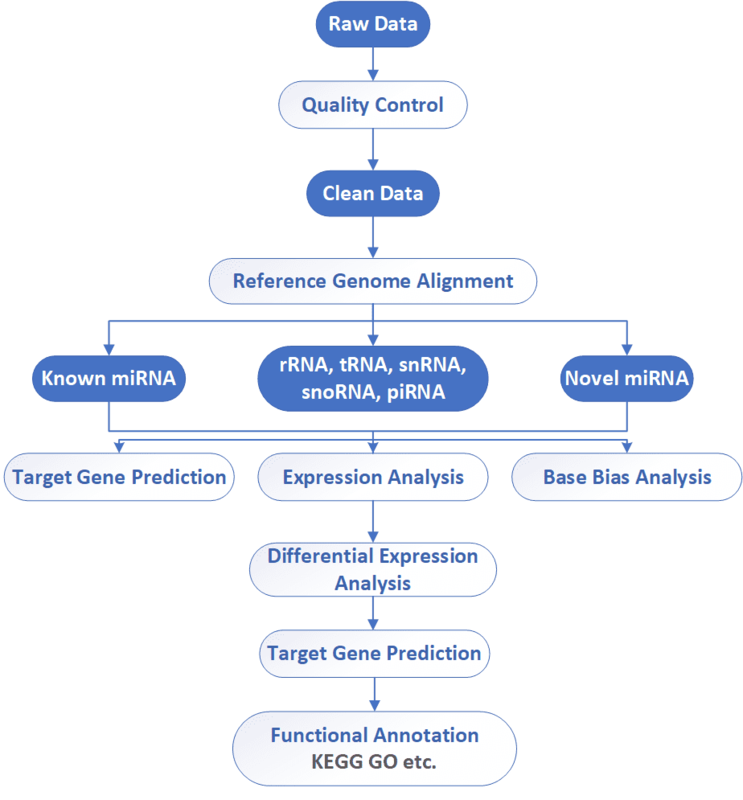 Figure 2. miRDeep* putative miRNAs and miRBase miRNAs (A), and genomic locations of the putative novel miRNAs (B). Using the SSEARCH aligner, 34 of the 99 putative novel mature miRNAs aligned well to at least one mature miRNA present in the miRBase v20. 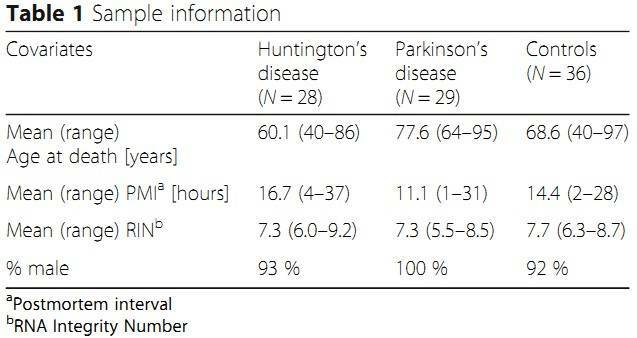 Differential expression analysis using linear models adjusting for age of death showed that 4 of the 99 putative miRNAs are differentially expressed between control and Huntington’s disease samples, and that 3 were differentially expressed between control and Parkinson’s disease samples (Table 2). The detailed data are presented in Table 2 that are generated by LIMMA v. 3.33.7. Figure 3. 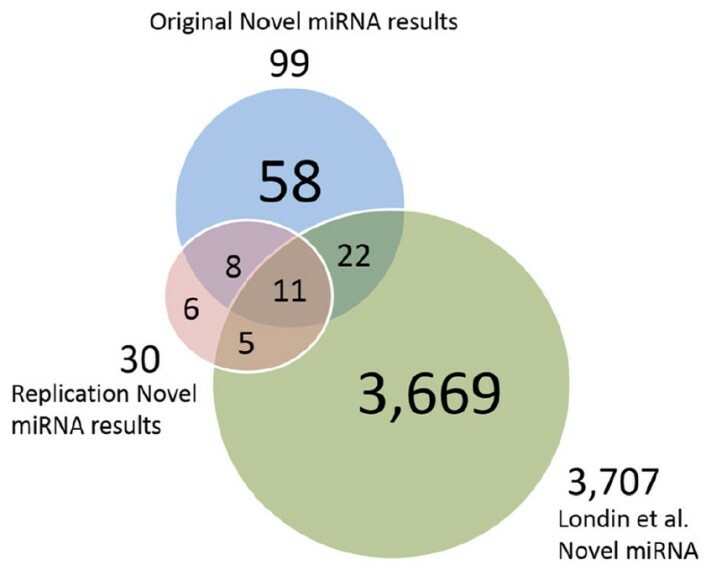 Putative novel miRNAs, replication data miRNAs and Londin et al. miRNAs. Wake C, Labadorf A, Dumitriu A, et al. Novel microRNA discovery using small RNA sequencing in post-mortem human brain. BMC genomics, 2016, 17(1): 776.